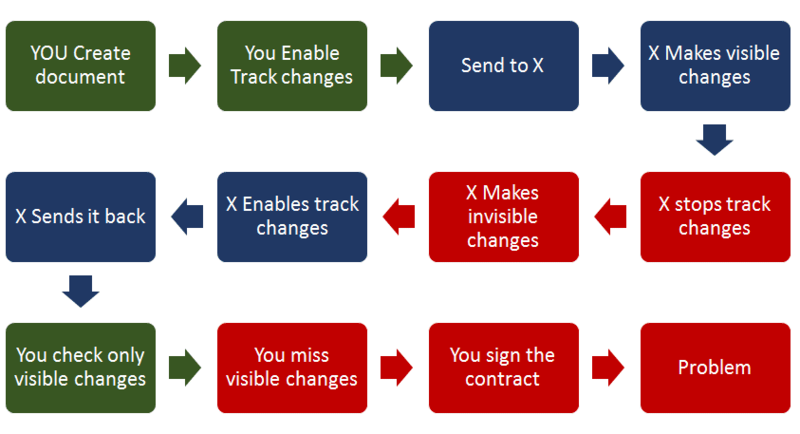 In short, anybody can activate and deactivate track changes. This can be used to mislead you and cheat you. Many of us resort to comparing the original and revised document for fear of this problem from affecting us. 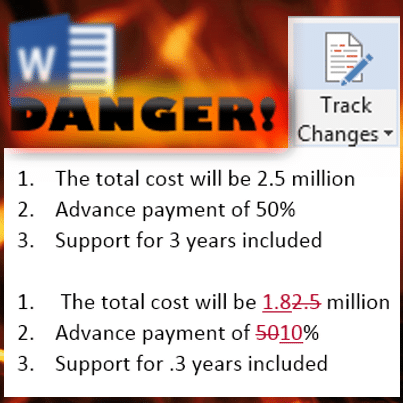 This can be done using Review – Compare document feature. However, it is an extra step and does consume time and effort. Solution: You never thought this would be possible! Microsoft has given a solution to this dangerous problem long back – many years back. It is just that nobody noticed. Close this window and Send the document to the other party. Now you are safe. The track changes button is simply not available now! Before you ask, it is not accessible programmatically as well. 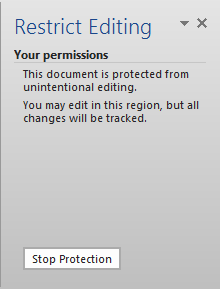 Step 2 – Choose Restrict Editing – Click on Stop Enforcing Protection. Type the password. It should work. This way it is proven that the other party has not tampered with the Track Changes Protection. Potentially, the other party could select the entire document, copy paste it to a new one and manipulate it. These steps ensure that the original document has come back to you. But Microsoft does not give up. They know that it is needed by the world but the world is not reaching there – may be because it was too deep down in the UI. So in 2013 they made it really simple. Now you can do all that we did earlier using SEVEN steps in just ONE step. Drop down the menu below Track Changes and choose Lock Tracking. Great example of how Microsoft tries to refine the user interface to increase discoverability of highly useful features which are not easily discoverable. But I still have my own doubts whether people at large will discover this feature. You know why? Nobody drops the drop-down to check what is there. Curiosity is dead when it comes to Office. This feature is so important that it is worth adding to the standard policy or standard operating procedure. It is also a good idea to include this topic in the induction program or training material for new recruits (at any level of seniority). Please share this knowledge with all your friends, colleagues and legal contacts. Great Article and feature highlight. Thank you. This is super , will share with my legal team .